ConceptDraw DIAGRAM extended with Matrices solution from the Marketing area of ConceptDraw Solution Park is the best Deployment Chart Software. 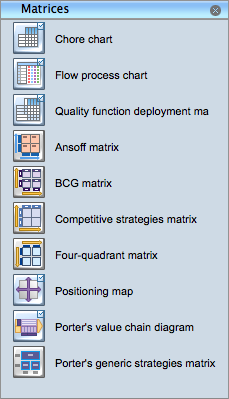 The Matrices solution offers you the useful tools for creating Deployment Charts in just minutes. Simply drag the needed object(s) to your document, enter the data and make the needed style and color changes. The Matrices library from the Matrices solution contains a set of predesigned vector objects. 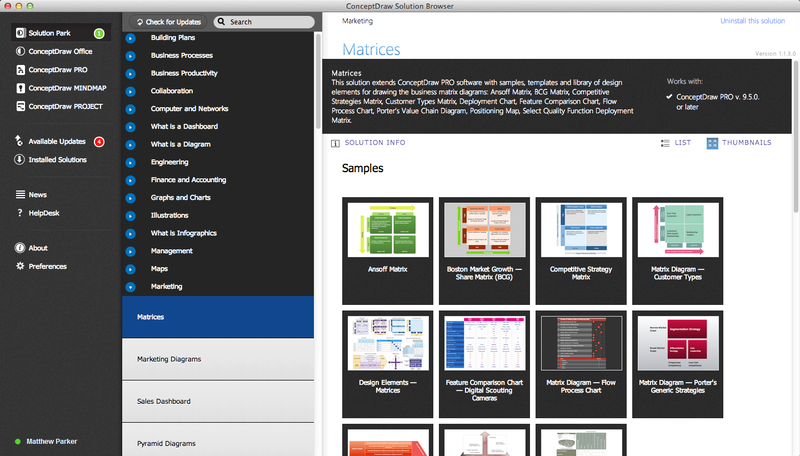 The Matrices solution provides also wide variety of templates and samples. 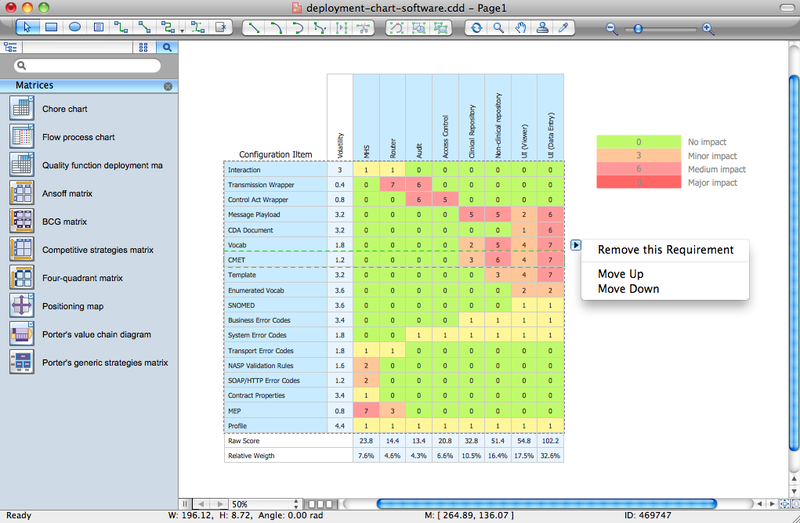 It's easier and time saving to design a Deployment Chart based on an existing template or sample. Choose the desired template from ConceptDraw STORE and make changes. Example 5. Deployment chart example. This Deployment Chart was created in ConceptDraw DIAGRAM using the Matrices Solution from the Marketing Area of ConceptDraw Solution and shows configuration matrix. You can see the simple scale of severity of impact. An experienced user spent 15 minutes creating this sample. Use the Matrices Solution for ConceptDraw DIAGRAM to create your own Deployment Charts of any complexity quick, easy and effective. The Deployment Charts designed with ConceptDraw DIAGRAM are vector graphic documents and are available for reviewing, modifying, converting to a variety of formats (image, HTML, PDF file, MS PowerPoint Presentation, Adobe Flash or MS Visio), printing and send via e-mail in one moment. 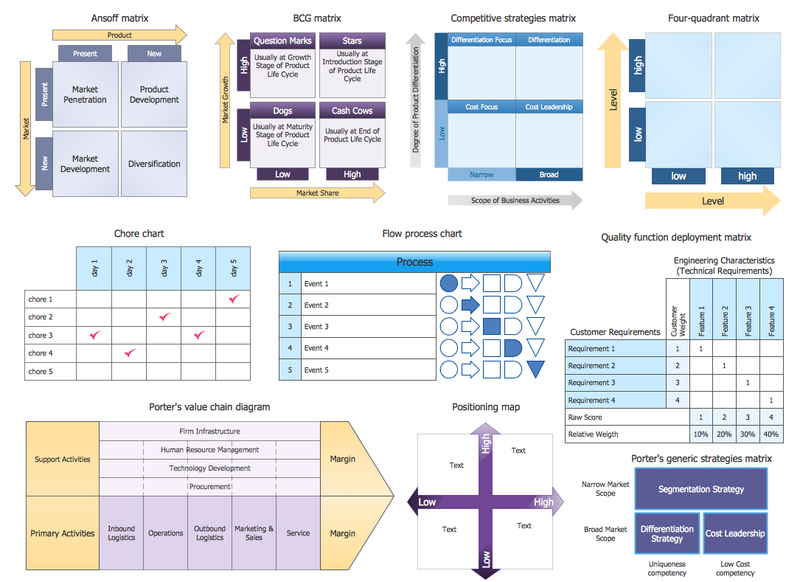 ConceptDraw DIAGRAM v12 extended with Matrices Solution from the Marketing Area of ConceptDraw Solution Park is a powerful software for drawing various types of Marketing Matrices: Ansoff Matrix, BCG Matrix, Deployment Chart, Feature Comparison Chart, Competitive Strategies Matrix, Flow Process Chart, Porter's Value Chain Diagram, Positioning Map, and many others. Many things can be listed as potential strengths and weaknesses of a company. To create a good-looking scheme, use SWOT analysis software and enjoy the results within a few minutes. A good practice is to make a SWOT analysis twice a year.